The view from a balcony at the Park Place Hotel in Traverse City. Here are the top 10 Northern Michigan hotels with a view—just in time for your next Northern Michigan vacation. The following winners were determined by more than 10,000 participants who voted in MyNorth’s 2014 Red Hot Best annual contest. So get your bags ready and feel free to pack light—you’ll never leave the hotel with these kinds of views. Find all 300 Red Hot Best winners in 101 categories in the 2014 June issue of Traverse, Northern Michigan’s Magazine. Grand Hotel, Mackinac Island — An unforgettable experience. Transport yourself to another time and enjoy the majestic views of Mackinac Straits during afternoon tea as horses prance by the porch. We promise we’re not making this up. The Lakeview, Shanty Creek Resorts, Bellaire — World-class golf, restaurants, and views. What more can you ask for? Grand Traverse Resort and Spa, Acme — A true Northern Michigan resort experience: expansive grounds, freshwater galore, challenging golf courses, and, of course, a spa to boot. Arcadia Bluffs Golf Club, Arcadia —With views of rolling hills set against bright blue water at this Nantucket-style lodge, there’s simply no need to leave your room. 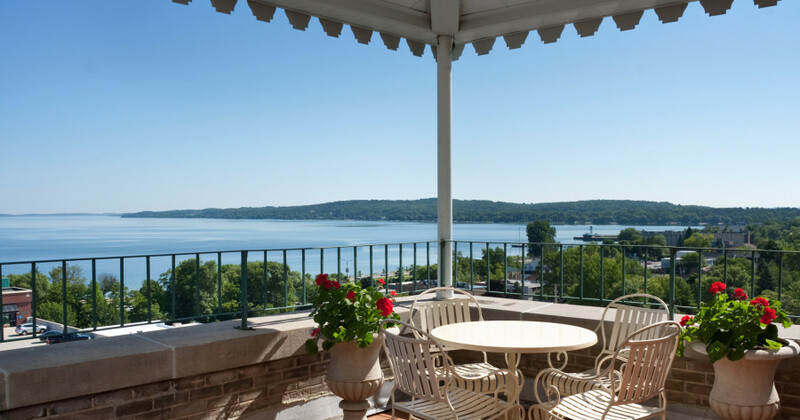 Bayshore Inn, Traverse City —A Victorian-style hotel located right on the water within walking distance of downtown. Chateau Chantal, Traverse City — Immerse yourself in Traverse City’s wine country at this B&B on Old Mission Peninsula. Enjoy a glass of Northern Michigan wine on your balcony overlooking wineries and the bay. Cherry Tree Inn & Suites, Traverse City — Right on West Bay, this place is steps away from downtown, yet feels like it’s miles away from the bustle of the city. Homestead Resort, Glen Arbor — Located in the heart of the Sleeping Bear Dunes, this hotel offers the tranquil setting you crave. Hotel Iroquois, Mackinac Island —A Victorian hotel right on the Straits of Mackinac takes you to another world and, unfortunately for your pocketbook, you’ll never want to leave. Park Place Hotel, Traverse City — The best of both: prime downtown location and spectacular views of the water.